The Bnei Brak Therapeutic Tory Library (TTL) was established in 2010, before Achiya moved into its new, spacious building and the number of children receiving therapy via the center was significantly smaller. Our experience at Achiya’s Elad TTL has shown us that proper use of the TTL significantly reduces time in therapy. Therefore, we would like to expand the TTL in Bnei Brak so that it can serve the 1,100 children presently receiving therapy there. How does the TTL differ from a regular toy library? The TTL was created to advance therapy. The librarian is responsible to work together with the therapist to provide the children with the appropriate toys, instruct the parents in their use, review the evaluation sheets filled out by the parents and provide recommendations for the future. 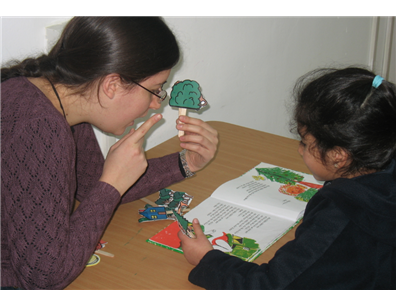 It is the responsibility of our multi-disciplinary staff of therapists (including occupational, speech, music, hydro, physical, drama and physiotherapists) to choose the initial supply of educational toys and games, update them regularly and supervise the librarian’s work with their clients. The therapists have the option of scheduling play sessions at the library, under the librarian’s supervision, at no extra cost to the parents. A large sunny room adjacent to the main library is available for this project. But the main thing is, the kids have fun while learning, and as we all know, that’s always the best way to learn! For the last twenty years, Achiya has been helping thousands of children who are diverse learners within the Haredi (Ultra-Orthodox) community of central Israel through its multidisciplinary programs. Secular Israelis and Arabs also use our services. Our philosophy is that it is easier to resolve a problem before it becomes a crisis. In providing these children with the tools they need to succeed in life, we prevent them from dropping out of school, becoming social outcasts, or worse. To put it simply, Achiya saves children before they need to be saved. Achiya's mission is to develop and give tools to children in the Israeli Ultra-Orthodox community who are diverse learners, so that they can succeed in a regular classroom. At Achiya children Learn That You Can. We change how children who are diverse learners view themselves and how people in the community view them. We are preventing these children from dropping out of school and enabling them to become self-supporting, contributing members of Israeli society. Achiya saves children before they need to be saved! Changing the educational system: Achiya’s Teachers’ Training College was the first teachers’ training program for Haredi men to introduce special education courses. We also have an an Educational Counseling B.A. program in collaboration with the Bar Ilan University. Our 3,000 graduates have changed the Talmud Torah (i.e. Ultra-orthodox schools for boys) educational system in Israel and another 1,700 students presently studying in the college's 14 branches throughout Israel will soon join them. Identifying children who need help: In 2012, our early childhood outreach programs screened over 3,400 children for signs of learning disabilities, ADHD and developmental delays. More than 600 children took part in direct intervention in the schools. Multidisciplinary treatment centers: In 2012, Achiya’ s Bnei Brak and Elad Learning and Developmental Centers serviced over 2,300 children providing over 35,000 private sessions of professional therapy and/or specialized remedial tutoring. We’d like children or classes to sponsor specific toys for the library, as the more toys we have, the more children we help, and even though as a tzedaka organization we get a discount, it can be expensive. Don’t forget, many of these kids come from homes where toys are an unaffordable luxury, so this toy might be the only toy they have! So they’re getting therapy, while having fun – what could be better? A child insisted on learning while sitting on the floor under the desk. His teacher, an elderly grandfather would climb under the table to learn with him! Anyone who comes to Israel is invited to visit our beautiful center not far from Tel Aviv. It's beautiful to watch children growing and changing.